South Carolina Rep. Trey Gowdy, who headed the four year Benghazi investigation, railed at Deputy Attorney General Rod Rosenstein during a recent appearance before Congress saying the 14 month long investigation by Special Counsel Robert Mueller is taking too long. "If you have evidence of wrongdoing by any member of the Trump campaign present it to the damn grand jury. If you have evidence that this President acted inappropriately, present it to the American people," Gowdy said to Rosenstein, who supervises the Mueller probe. "Whatever you got, finish it the hell up, because this country is being torn apart." 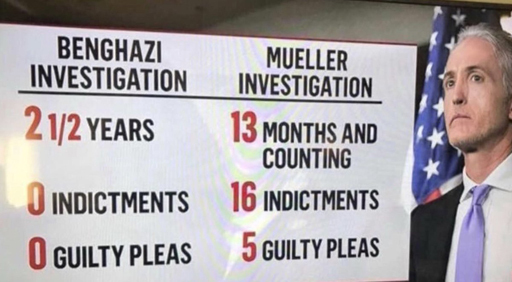 Benghazi was a 2.5 year investigation with zero indictments from a panel led by Gowdy. The investigation into Hillary Clinton's emails took 2+ years and there were zero indictments. In the first 14 months of the Mueller investigation, there have been 23 indictments. "Chairman Gowdy urgently demanded that the Justice Department wrap up the investigation, yet he literally spent years and years investigating Hillary Clinton as part of the GOP's eight-committee investigation of Benghazi, which resulted in nothing but a deluge of false Republican allegations that helped get Donald Trump elected President," said Maryland Rep. Elijah Cummings, who was the top Democrat on the Benghazi committee. Trey Gowdy telling somebody their investigation is lasting too long is like Rapunzel telling somebody they need a haircut.